Welcome everyone! 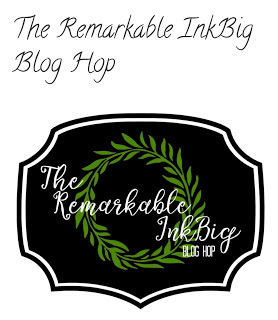 I am so excited to be a part of The Remarkable InkBig Blog Hop for September 2017. This month the theme is Halloween. How can we go wrong with some spooky fun, as Halloween is just around the bend. 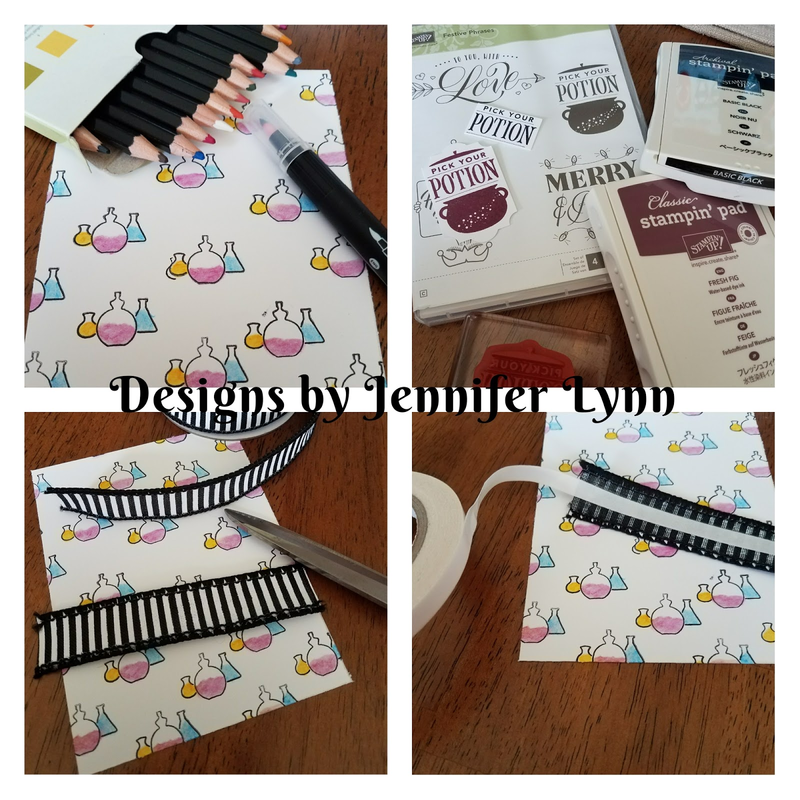 You may just be starting the blog hop here at my blog – JENNIFER VAN WART or may have come from the person previous to me in the list. If you get off track at any time, the full lineup below will help you move along from blog to blog so you get see all the projects and creative inspiration. At the moment you are visiting JENNIFER VAN WART. I created two special cards for your spooky pleasure. I have provided some basic instructions on how each of them came together. If you have any questions please don't hesitate to ask. This card is what I like to call an "Easy Peesy" card, with a touch of Bling, of course! 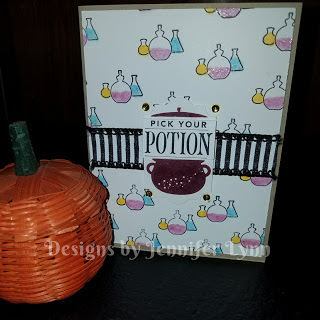 I first stamped the cute little beakers from the Spooky Cat stamp set in black ink. I then took Stampin' Up! 's watercolor pencils and colored them in with different line marks to give the affect of liquid in them. After this was done, I used a blender pen to blend the colors to a smooth finish. 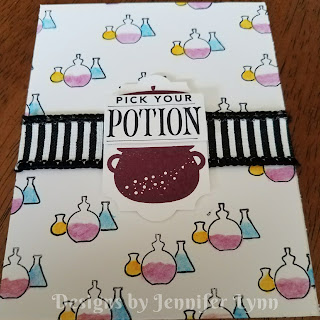 Once this step was all set, I stamped two Pick Your Potion images from the Festive Phrases stamp set. One was in Fresh Fig and the other in Basic Black ink. 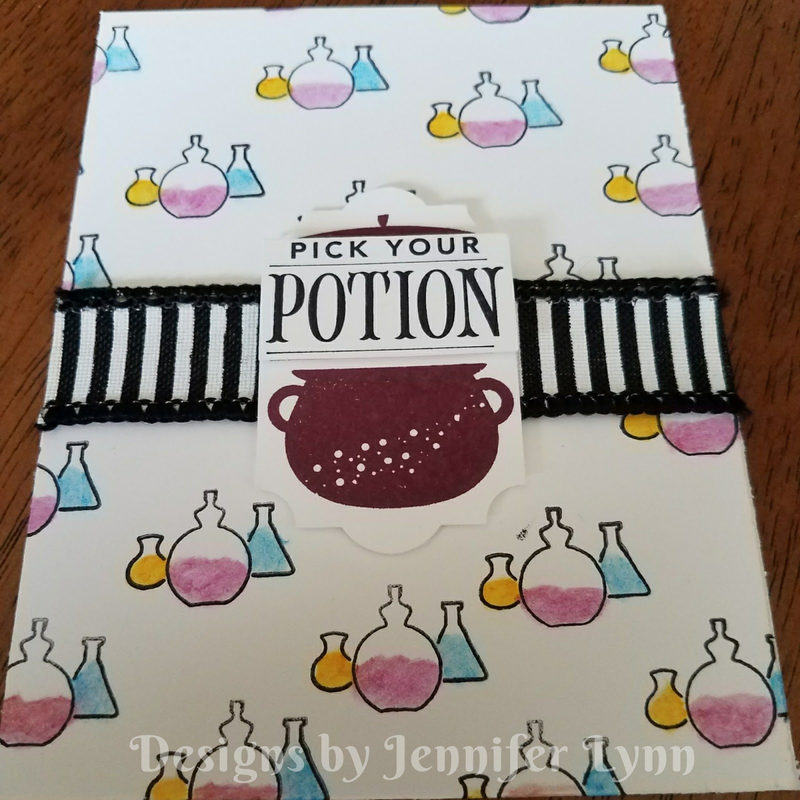 I cut down the words on the basic black image and saved the caldron for a later project (remember ya never know where you might use that extra cute image). You can see each step in the picture below. I then added some dimensionals to the back of this image and put it aside. 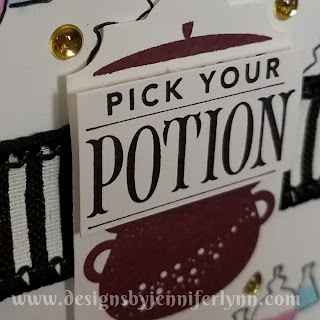 Then I assembled the ribbon to the card front, added the Pick Your Potion phrase on top of the ribbon in the center, and added some fun Gold Enamel Shapes and Wink of Stella for some Bling! 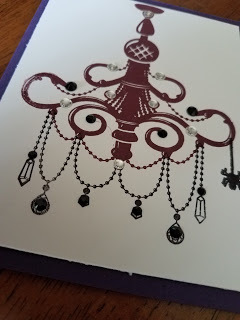 The finished card shows whimsical fun, with a touch of bling. I hope you think it is super cute like I do. 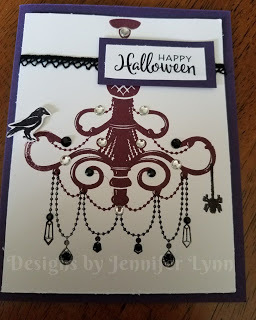 For my next card I was inspired from Disney's Haunted Mansion. I like to call this one my Haunted Chandelier. It's kind of ironic, I am totally anti-spider, but what is more scary then spider webs and a spider for this spooky chandelier??!! I think it gives it just the right spooky touch. I can't lie, this is probably one of my most unique stamp sets I own and I truly see every occasion with this one. First I stamped the chandelier in Fresh Fig. Next I added a touch of basic black bling and a spider. (I do NOT like spiders...lol). For this next step I used some fun silver enamel shapes and one of my most loved embellishments from the Holiday catalog, our Black Rhinestone Jewels. I absolutely LOVE these!!! So I added one more element that really pulls everything together...Spider webs!!! Thanks for taking part in our blog hop. There are truly so many amazing ideas and so much inspiration, you definitely don’t want to miss. Remember that currently you are at my blog – JENNIFER VAN WART, so check the blog hop line up list to see who is next in the list. Welcome everyone! I am so excited to share this fun post today because it takes two things I love and brings them together. 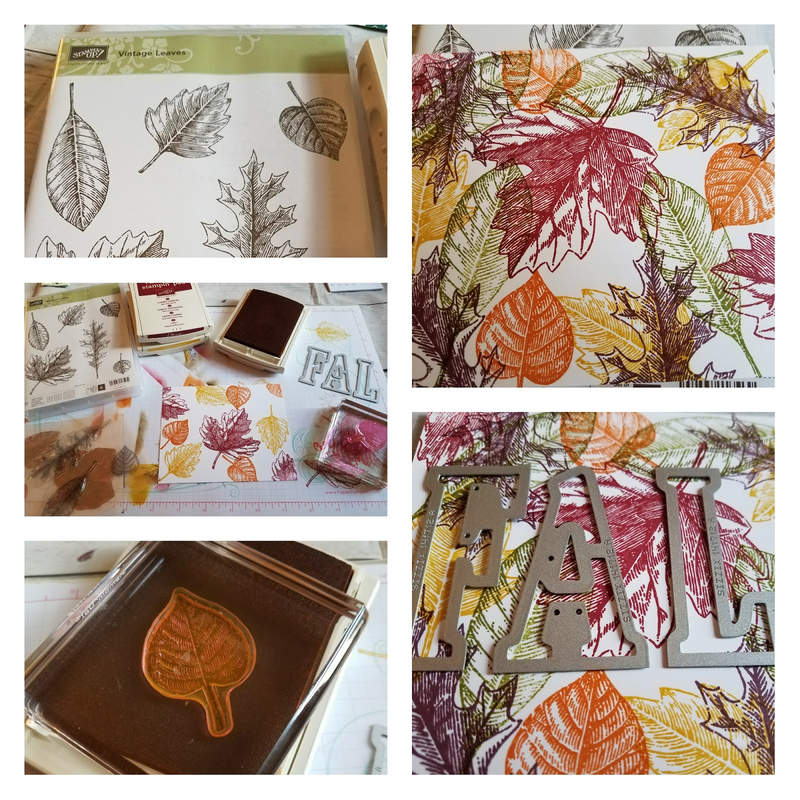 Fall and stamping!!! The theme for today's post is fall fun. Fall happens to be my favorite season. While I am a beach lover and definitely a beach girl, I am an October baby so there is no doubting my love for pumpkins, fall colors, and fall bucket lists. For my first project I did a card with a technique known as the Eclipse Affect. I used a stamp set from our annual catalog called Vintage Leaves. I absolutely LOVE this stamp set. 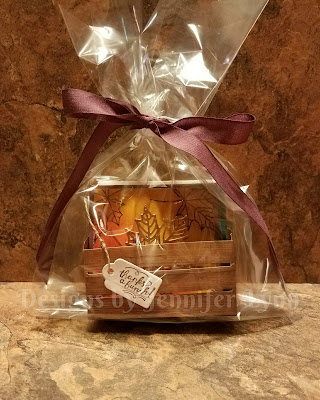 This stamp set is truly the perfect fall set. I randomly stamped different color leaves all around whisper white cardstock using some fun fall ink pads: Crushed Curry, Cherry Cobbler, Old olive, Fresh Fig, and Pumpkin Pie. Once this was done I used my big shot to die cut the word FALL out using the Large Letter Framelits. 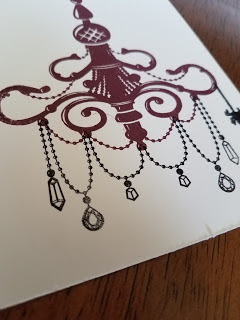 After this step was done I used dimensional dots and added this mat to Fresh Fig cardstock. Here you can see a couple of images of the final card. 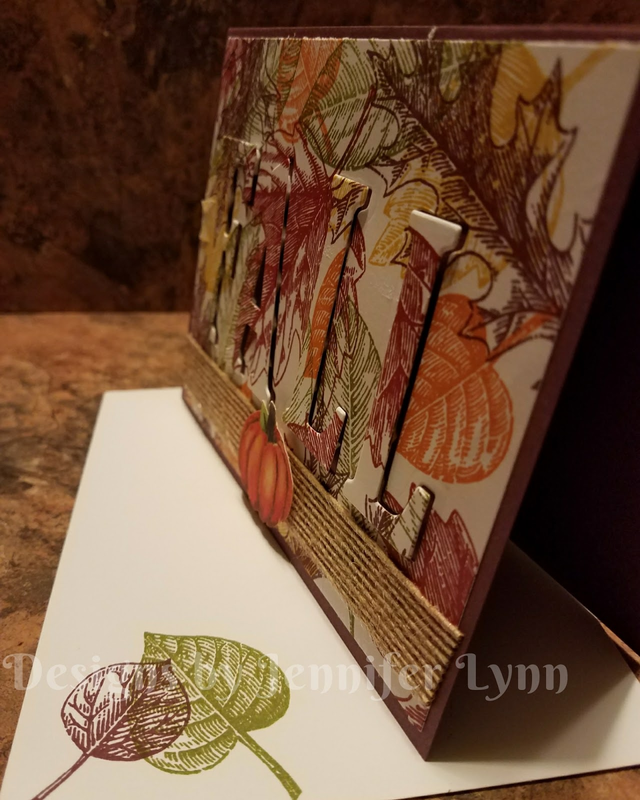 I also added some fun Burlap Ribbon and a fussy cut out pumpkin from Painted Autumn Designer Series Paper from our amazing Stampin' Up! 2017 Holiday catalog. 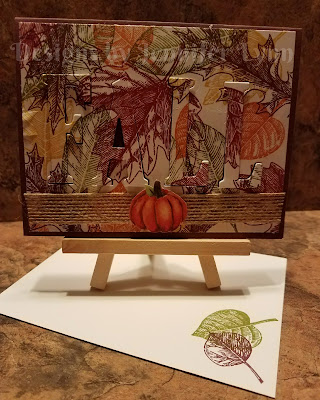 While this card is adorable and full of fall foliage, I thought it would be nice to have a little gift to give with it. I opted to create a cute little wood crate with 3x3 cards and envelopes for the perfect gift. 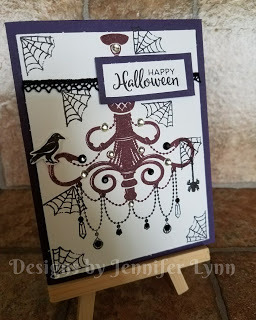 With this project, I used sponge daubers to color up a piece of whisper white cardstock with a variety of fall ink pads again. 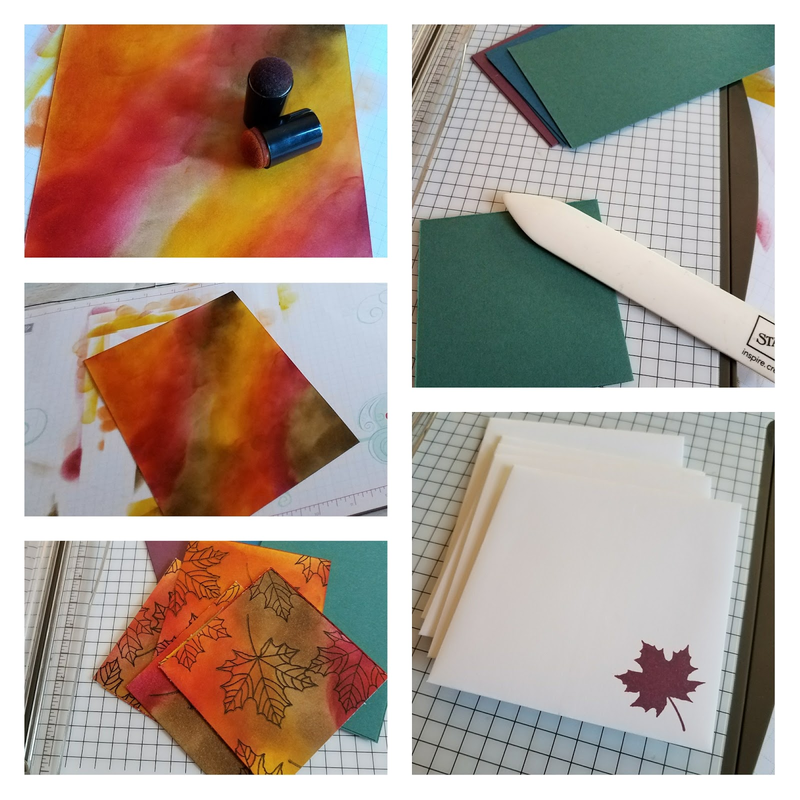 Once blended, I took a leaf from an amazing and versatile stamp set called Colorful Seasons. This stamp set also comes as a bundle and trust me you will want it!!! Plus ordering this set as a bundle saves you 10%!!! 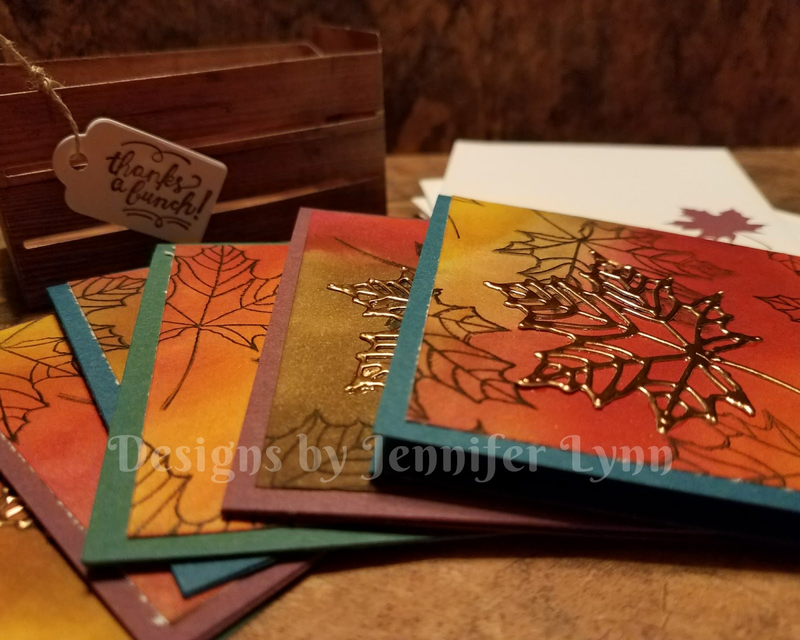 Once I stamped the leaves in Basic Black to really make them pop, I cut the squares into 2 3/4 by 2 3/4 pieces and multicolored cardstock from our new In-Colors in 3x3 size cards. 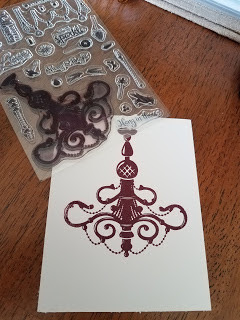 I also used the small leaf in Fresh Fig ink to stamp the little 3x3 envelopes for an added touch. After that is all set, I took a piece of copper foil sheet and die cut some fun leaves to add to each card. 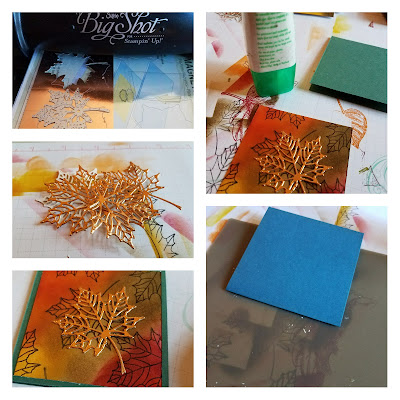 Using Multipurpose glue, I adhered the leaves to the cards and then used fast fuse to adhere the card to the base. One step I forgot to photograph was die cutting out the mini crate to make the adorable crate box. Don't worry I will have another project showing another crate project in the near future. 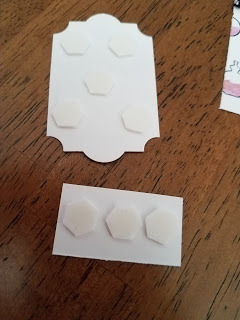 Tip: When using the multipurpose glue press down on a silicone mat to avoid excess glue sticking to another card. The excess stays on the silicone craft sheet and your cards dry perfectly. I hope you have enjoyed the fall inspiration today and you will come back soon for more creative fun. Don't forget to sign up for my newsletter and new blog posts. Below I have provided a least for each project with a product list for easy shopping. Have a wonderful day!! !